Some awful films become popular and successful, despite obvious technical and artistic flaws. Some great films suffer in obscurity undeservedly. Messiah of Evil (1973) is a case of the latter. Directed and written by Willard Huyck and Gloria Katz (screenwriters for American Graffiti and Indiana Jones and the Temple of Doom), Messiah is a thoughtful, introspective, and very original entry into low-budget seventies horror. Available on a small number of budget labels (Diamond Entertainment has it available on DVD), it is a film undeserved of the meagerness of its reputation. A small coastal town in California is the setting for an odd, creepy story. When Arletty (Marianna Hill) arrives, looking for her father, she quickly learns little is as it seems. Beneath the idyllic seaside village, a rot has begun to take hold. Folks speak in guarded, awkward tones, they spend endless hours on the beach at night, staring off into the ocean. Some have even developed a taste for raw meat. When she meets the town drunk (played by Elisha Cook, Jr, of course) and a trio of prying tourists led by Thom (Michael Greer), the sinister history of the town starts to reveal itself. 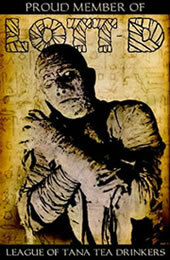 Messiah of Evil is one of the most unusual of early-seventies horror films. Taking some cues from Night of the Living Dead, it creates its own unique blend of horror and political commentary. Screenwriters Huyck and Katz make allusions to the Vietnam War, religious cults, and the 'creeping communist threat' of the fifties. Never committing itself as either political allegory or straight-ahead horror, it fascinates and intrigues at every plot twist. The actors are all first rate. The principals are all professionals, and give assured, convincing performances. The screenplay is clever, multilayered, and doom-laden. The film is filled with stark, original images and sequences (the theater and supermarket murders, the final assault on the house). The film was shot on a shoe-string budget, and it shows in every frame. Grainy and dark, and filled with rough edits, it can be hard going. Weathered due to poor filming or print damage, the only prints available are in poor condition. The audio in the last reel also somehow becomes 'detached', playing a half-second late. Somehow, however, Messiah of Evil survives some serious technical flaws. The even add to the disjointed, dreamlike quality of the story. 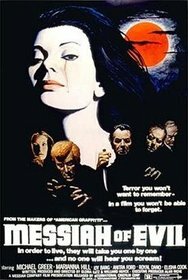 Not a film for the casual viewer, Messiah of Evil rewards the serious horror fan, and is well worth seeking out.